Magazine charts I love to stitch - SOON! My plan was to post at the beginning of the week, but before I knew it what I thought would be a quiet week turned into quite a busy week with dental issues for one of my dogs, a movie visit with a friend, dog-sitting 2 dogs for a friend - yes, I currently have FIVE dogs at home to look after - and various other things. Today I have to do laundry, household chores and some baking as well as look after all the dogs, but I wanted to share my stitching with you before I start with all that boring housework...! I just love working on this one and as long as I don't run out of any more threads, I hope I can finish this well in time for Halloween. ...but I find it extremely boring to stitch with only blacks and browns, so I don't think I'll get much more progress done before I can send for some more threads (ie reds and greens!) which hopefully can happen next week. Fingers crossed! I'm also stitching this little freebie snowman from Cross Stitch Crazy magazine issue 220. This snowman is a special project since I'm doing it together with my sister. Once I'm finished with the stitching part, she is going to take over and incorporate it on a beautiful Christmas tag using her scrapbooking techniques. I can't wait to see the result! Lastly I have made a tiny start on Country Cottage Needleworks 'Cookies for Santa'. It took me quite some time to stitch the gridlines, since I decided to use sparkling aida and it was difficult to make out the correct holes in the fabric. I hope this project will look OK together with the extra sparkle that the fabrics provide; I just really wanted to have some fun with it and I loved working on the sparkling aida last time I used it! I have a feeling this might be a slow-going project though, since it's just for fun and will therefore be far down on the list of crafty things that I REALLY want to get done before Christmas! 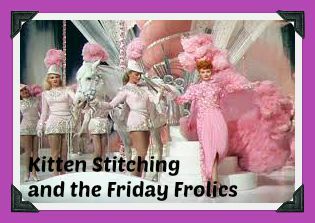 Hope you're all well and having fun with your stitching and other crafty projects! Here's a quick update on what I've been stitching on this week. Even though I'm not really a Halloween person, I'm having soo much fun stitching all these little quirky motifs:) And the best part is that if I can finish this one soon - which feels quite doable - I have an even bigger design like it to tackle after that, lol! 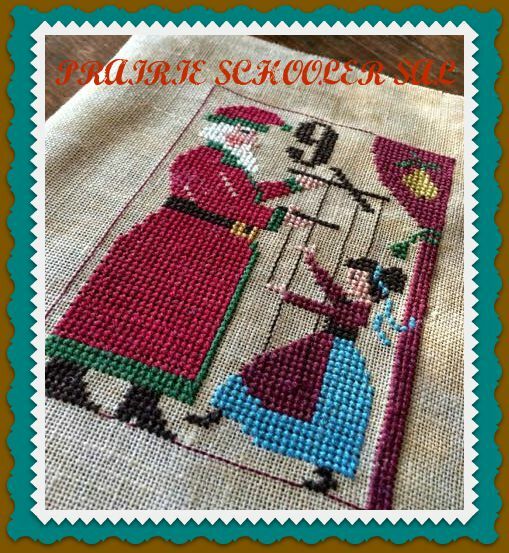 I have also started Cross Stitcher magazine's SAL that they have been running all year. I feel in love with it straight away - since the first piece featured a cute Christmas dog! - and now that I'm stitching again I had to make a start! Hope you're all well? I can't believe I haven't posted for almost two months... Oh well, time flies when one crochets, lol! But guess what??!! My stitching mojo is back! Happy Days! I think it happened sometime during the 17 days and nights when I watched the Olympics and crocheted around the clock...suddenly I found myself longing for a change...And thinking of all my cross stitch projects...and thinking even more of my Prairie Schooler chart stash that I am dying to dive into! So of course you wonder what projects have I picked up now that I'm back to the lovely aida, cross stitch needles and DMC floss? I have really surprised myself with picking this Halloween chart. Sweden isn't too big on Halloween itself and only celebrates it because we've been influenced by the Americans:) Personally I don't celebrate it at all, but I have seen some really cool Halloween charts on your blogs and on the online stitching stores and began fancy stitching my own witches:) And this PS chart is perfect for me as it only uses 4 DMC colours! So there we are. I decided to pick the smaller chart to stitch first and I hope I can get it done in time for Halloween THIS year, haha. However, my start didn't exactly go smoothly...:(. First of all I realised that yet again I didn't have all the threads I needed, like the reds and greens...Pretty important colours for a Xmas design I'd say! However, I did have dark grey -yay! - so I decided to stitch the sleigh and counted and counted to make sure it ended up in the right spot. And of course it didn't!! I was so pleased with my little sleigh until I realised that I would have to frog it... The whole sleigh... But I perservered and stitched another sleigh and added some more gray and brown and I will order the festive colours later on when I can afford it. It already feels as if I'm falling behind on this project too, lol. Lastly I have made a start on this cute little Snowman freebie from Cross Stitch Crazy magazine. I received my new chart stash from Stitching Bits and Bobs in the US! I can't believe how fast I received my order; it didn't take them much more than a week to get it to me! That is faster than some companies here in Sweden! Then I wanted Christmas Eve that I saw Gominam at Stitch Niche stitch earlier this year, and of course I had to get Happy Christmas with all those cute Santa lodgings! ...Cats, Bats & Witches! I just love all those black witches and the bats etc:) I don't really celebrate Halloween, but I guess I have been affected by all the fun Halloween stitching I've seen on other stitching blogs. So it's your fault that I got this one, lol!!! Can't wait to stitch them! Then I picked a chart that I have seen on other websites and that I just love. I love the colours and the words and the decorations...! Now I'm waiting for a batch of threads I have ordered from http://www.sewalong.co.uk/ and then I can hopefully make a start soon. Meanwhile I have to ponder what on earth I'm going to do with all the Christmas stitching I'm planning to do...lol! Happy Stitching and stashing everyone! I had a lovely birthday celebration with lots of lovely gifts and kind thoughts sent my way, and made me feel very grateful to have such lovely friends and family <3 <3. AND, I was lucky enough to receive some birthday cash, which meant that I could order some more PS charts online from the US!!! I'm sooo excited for them to arrive, and I can feel my mojo starting to come alive when I think of those gorgeous charts in my hands! Of course I still have to buy some more threads, but I'm hoping that after the sad news of the Brexit, I might be able to order some threads from England and benefit from the exchange rate. A sad state of affairs, but there it is. Since stitching stash is so expensive in Sweden you have to make the most of every opportunity that comes your way...! You may have noticed something new on my blog...??? @handarbetsgumman (Swedish for 'the little woman who enjoy crafts'). So if you think I'm bad at updating the blog you're welcome to join me at Instagram at any time. I mostly show my crafty WIPs, which are all crochet-inspired at the moment, but when I'm back in the land of cross stitching I'm sure there will be plenty of pics of cross stitching to enjoy too. My oldest furbaby looking for shade and escape from the heat. My sunny seaside mandala (inspired by a crochet pattern from www.bautawitch.se. My talented sister had wrapped my birthday gifts soo beautifully! One of my gorgeous - if I may say so myself lol - crochet WIPs. My darling old boy is turning 11 years old in a few days time...Where did the years go?! furbaby enjoyed resting under the wooden bench:) Cutie pie! Another one of my crochet WIPs! Tulip Mandala pattern found HERE . My furbabies have played outside in the sunshine. with the mandala I was working on...so I gave it to her of course! We talked a lot about my lovely grandpa who passed away in 2004. ...and attached some of them to my crochet hearts! A good friend's son graduated and had a lovely celebration with some lovely food. Especially this Eton mess with summer berries was to die for!!! I have an order for a crochet wrap which is coming along nicely. Last Sunday my sister and I sold some stuff at mum's allotment. the Swedish colours to show my support for all our competitors! he's turning a very distinguished 11 years old in a couple of weeks! My mum has an allotment and in a couple of weeks all the allotment owners and their families are having a kind of 'flea market' sale for the general public, and my sister and I are planning to have a little 'stall' where we are going to try to sell some homemade baked goodies (baked by me), and some beautiful homemade paper craft like greeting cards and flowers (made by my sister), and some small crochet things (made by me). We did it a couple of years ago too, and we were surprised to see that we actually made some money!!! We are both looking forward to it as well as dreading it and battle with a lot of negative thoughts...Will people really want to PAY for our things? Will anyone even be interested? Do we even make things that are good enough to sell?! Etc, etc... But we try to stay positive and think of it as a fun day that we can spend together; if we make any money it is a big bonus!!! And if we don't sell anything we have both got all our Christmas gifts made already LOL! As usual my inspiration comes from the lovely Swedish crochet blog Bautawitch ! OMG, how on earth did I manage to stitch soo much since last time?! My name is Annie, I'm 40+ and I live in Sweden with my three wonderful dogs. Although I learned to cross stitch when I was a child, I didn't get into it properly until much later. I discovered cross stitch magazines while I lived in England, and when I came back to Sweden ten years ago I started to stitch more regularly. Now I'm hooked! I prefer to stitch on aida and I'm still a bit wary of speciality threads and beads, but I'm learning! You can contact me directly at tprjakobsson@gmail.com . Check out my Instagram (@handarbetsgumman)! HAED Mini Lily of the Valley - Page 2 Finish!! !